Dr. Cangcuesta is the owner/operator of Southside Ear, Nose, & Throat and Southside Hearing Aids. He began practicing medicine in 1974 after obtaining his Doctor of Medicine degree from Cebu Institute of Medicine in the Phillipines. He completed an otolaryngology residency at Cornell University Medical Center in New York and a fellowship in Head & Neck Surgery in Albany. He has been practicing general otolaryngology in Virginia for more than 30 years. He joined Southside Head & Neck Surgery (now known as Southside Ear, Nose, and Throat) in 1996. He maintains surgical privileges at Southside Regional Medical Canter and John Randolph Medical Center. Dr. Cangcuesta previously served as the Chief of each institution’s Department of Surgery. He also has surgical privileges at the Colonial Heights Surgical Center. He is Board Certified by the American Board of Otolaryngology and is a fellow in the American Academy of Otolaryngology – Head & Neck Surgery and the American College of Surgeons. Additionally, he is a member of the American Academy of Otolaryngic Allergy, the Medical Society of Virginia, and the Virginia Society of Otolaryngology – Head & Neck Surgery. Robyn Browne received her Doctor of Audiology (AuD) degree from James Madison University in 2016 and a Bachelor's of Science (BS) degree in Biology from Coastal Carolina University (CCU) in 2004. Dr. Browne was a scholarship athlete while at CCU; where she competed on the Track and Cross-Country teams and earned MVP, team captain, and conference champion honors. After graduating, she was a science teacher for several years before she decided to enter the field of audiology. She is dually licensed in the state of Virginia as an Audiologist and Hearing Aid Specialist. She has earned a Certificate of Clinical Competency from the American Speech and Hearing Association (ASHA) and is a fellow member of the American Academy of Audiology. In addition, she was voted as one of the best Audiologists in the Richmond VA area for ‘bedside manner’ in the 2018 edition of OurHealth magazine (https://issuu.com/ourhealthvirginia/docs/rvanovdec2018/33?e=30938993/65617286). Dr. Browne enjoys working one-on-one with patients of all ages and prides herself on providing individualized and personable care. She has a hearing loss herself and wears hearing aids; so she personally understands the difficulties faced from living with hearing impairment and adjusting to hearing aids. Tracy has been working at Southside Ear, Nose, & Throat for 10 years. She wears many 'hats' around the office but her biggest roles are greeting patients, scheduling surgeries, verifying insurance, and helping with allergy testing/shots. Tracy grew up in the Prince George area. She has two young children and enjoys spending time with them in her free time. 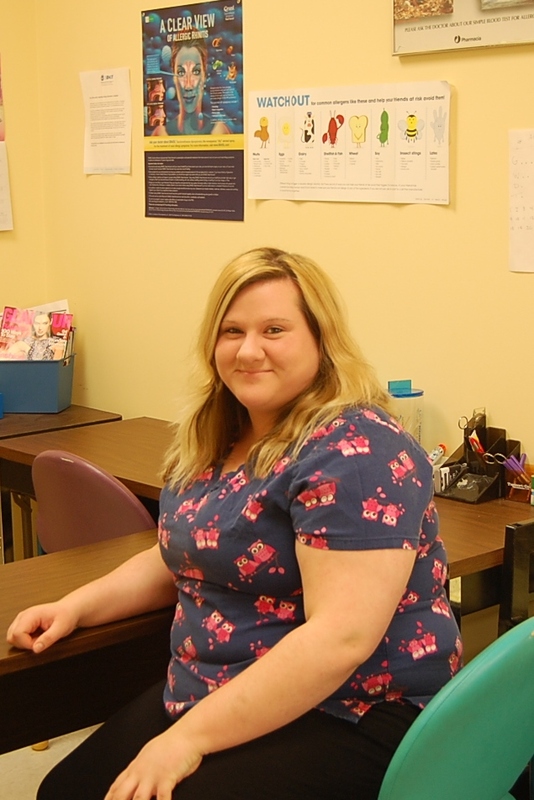 Theresa began working at Southside Ear, Nose, & Throat in April of 2018. You will likely be greeted by her upon arrival at our office as she serves as our Front Desk Receptionist. Theresea was born and raised in Colonial Heights and graduated from CHHS. She has three children and in her free time, she enjoys sewing, gardening, spending time with friends and family, and volunteering at the local animal shelter. Karly started working for Southside Ear, Nose, & Throat in the summer of 2018. She will likely be the one on the other end of the phone line if you are to call in to the office or if you get a reminder phone call. Karly also administers allergy testing and injections and helps with files/charts; amongst other things. She currently attends Colonial Heights High School as a senior and she obtained a CNA in June 2018. In her free time, Karly enjoys dance (she is trained in Lyrical and Jazz), shopping, spending time with friends, swimming, and going to the gym.